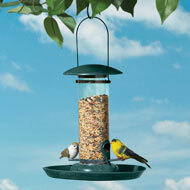 Jewel Box Suction Cup Hummingbird Feeder, 8 oz. 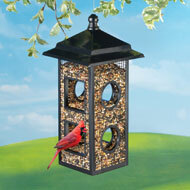 Welcome your flying, feathered friends with decorative bird houses and bird feeders from Collections Etc. As always, our selection is teeming with one-of-a-kind finds that serve a purpose — in this case, to feed our avian amigos — and simultaneously bring personality and style to your environment. Installing a bird hideout or two in your landscape helps make it particularly hospitable to wildlife and makes for wonderful birdwatching opportunities. We have a collection of unique bird feeders at Collections Etc., with styles that pay tribute to many personalities and preferences. Whether shaped like a moose, a rabbit, a snowman or even a bird itself, a novelty feeder makes any garden feel extra cheery. 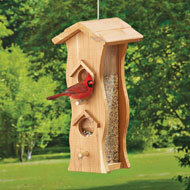 We also have classic bird houses shaped like — you guessed it! — houses, for the garden décor classicist. 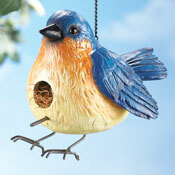 Be sure to stop back often to find more exclusive and fun garden decorations for your flying visitors.